One more week and I'll be in our new house with a BIGGER kitchen that has a MASSIVE stove and plenty of counter space. Ladies and Gentlemen, I'll be cooking up storms!! My house hunting was successful, we'll move just down the road, 3 minutes to walk from where we live now. No time to sit down for even one second: get quotes from relocation companies, clean out cupboards, shelves and closets from anything that does not need to move along and pack the rest. And then there are the other things that are always around: do my regular freelance work, go the embassy to apply for new passports, finally a doctor's appointment to sort out my back (that has been sore since last Christmas), etc. What do you need for all that? ENERGY!!!! And high-energy food. Something that keeps you going for some time and provides all the nutrients that one needs. After sufficiently exploring zucchini breads (see my Apple Zucchini Cake with Walnuts, then Chocolate Zucchini Spelt Cake or my Vegan Chocolate Banana Zucchini Bread, I was in need of a new victim. And I found one: avocado! If you can put zucchinis and carrots into cakes, why not avocado? The good thing about avocado is, that its natural richness makes it unnecessary to add any butter or oil. That's all it does. You surely won't taste the avocados. The result: a lovely moist and all natural cake that's good and filling enough for breakfast. 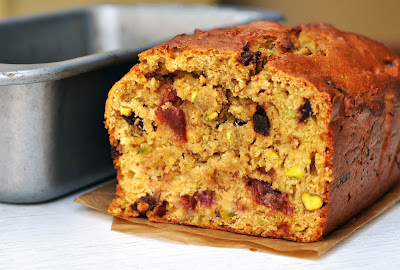 I love colorful cakes, That's why I put red cherries and green pistachios in. The cake will be as good with just raisins and any other nuts, like walnuts or pecans. Preheat oven to 180C (350F). Line loaf tin with parchment paper. In a bowl, sift together flour, baking powder, salt, and spices. Keep aside. In another bowl, beat the egg. Add mashed avocado, buttermilk and agave syrup and stir until combined. Combine dry and wet ingredients until just combined. Stir in cherries and chopped pistachios. Bake for about 45 minutes or until toothpick comes out clean. Let cool in the tin for 10 minutes before taking out. Let cool completely on wire racks.